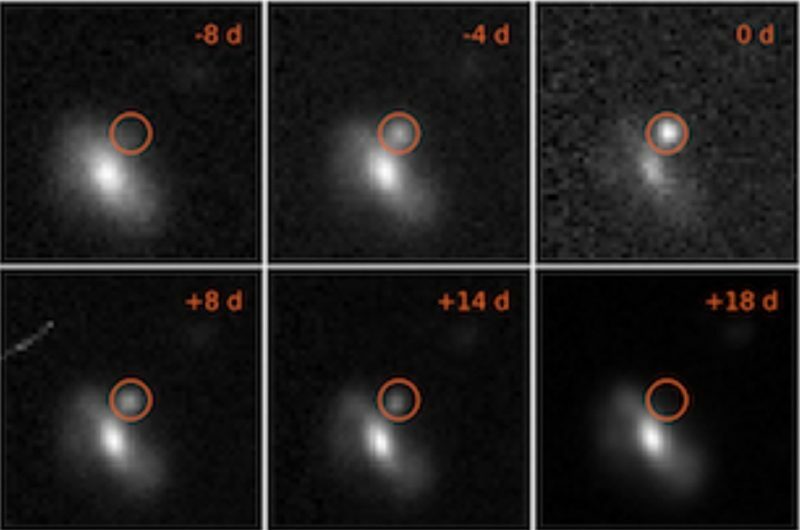 A team of astronomers at the University of Southampton has discovered 72 bright, quick events that resemble supernovae, but disappear in a matter of days. The finds from the recent survey were outlined in the group's presentation at the European Week of Astronomy and Space Science in Liverpool, U.K. These Fast-Evolving Luminous Transients (FELTs) were discovered in data collected from the Dark Energy Survey Supernova Program based from Cerro Tololo in the Chilean Andes. In this survey, the events appeared to be hot, ranging in temperature from 10,000 to 30,000 degrees Celsius (18,000 to 50,000 degrees Fahrenheit). In addition, they happened to be large, with most ranging in size from several times the distance between our Earth and sun to up to 1000 times this distance. These FELTs resemble supernovae in their ability to outshine an entire galaxy of stars, yet they differ in that they fade away on a timescale of days instead of weeks. "One possible scenario is that the star sheds a lot of material before a supernova explosion, and in extreme cases could be completely enveloped by a shroud of matter," commented the astronomers in their study. "The supernova itself may then heat the surrounding material to very high temperatures. In this case astronomers see the hot cloud rather than the exploding star itself. To confirm any of this, the team will need a lot more data." Image via M. Pursiainen/University of Southampton/DES Collaboration/ EWASS and NAM.